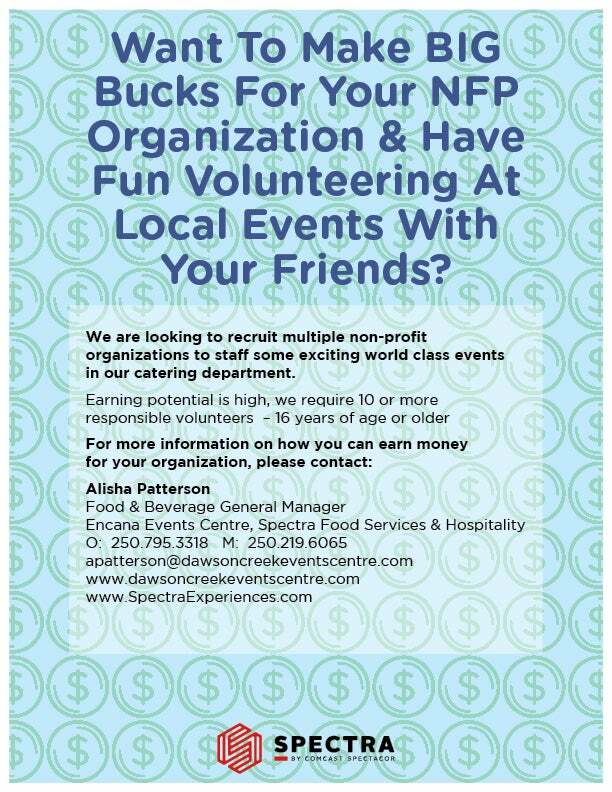 Spectra Food Services & Hospitality, the food & beverage operator at the Encana Events Centre, is pleased to offer an exciting fundraising opportunity for local non-profit organizations. This program is designed to be a long-term partnership with non-profit organizations who desire a consistent source of fundraising. Ovations have a corporate objective of community involvement and are committed to recruiting local non-profit groups to operate food & beverage concession outlets at the Encana Events Centre as a fundraising vehicle. Spectra Food Services & Hospitality provides food & beverage management, merchandise and hospitality management services to sports and entertainment facilities, convention centers, cultural attractions and gaming and hotel facilities throughout Canada and the United States. Spectra Food Services & Hospitality is proud to be the official food operator for the Encana Events Centre. The Encana Events Centre has four concession stands located throughout the building, offering you a variety of snacks and beverages to fill your hunger and thirst! Stop by one of our concession stands to enjoy a variety of snacks including popcorn, hamburgers, hotdogs and nachos – as well as more specialty items including Boston Pizza and other delectable treats. 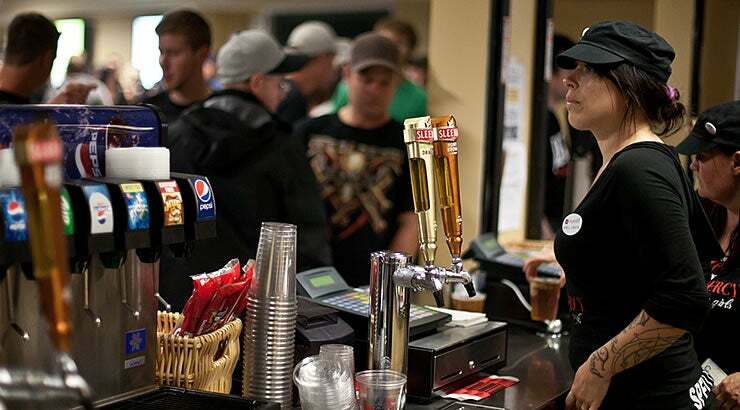 Each of our concession stands also offers a variety of drinks including colas, sport drinks, juice as well as a variety and coolers and of course Molson-Coors products on tap! Boston Pizza, burgers, hot dogs, chicken fingers, popcorn, pretzels, nachos and other tasty snacks and beverages including Pepsi, Molson-Coors products on tap, wine and coolers. Burgers, hot dogs, chicken fingers, popcorn, nachos and other tasty snacks and beverages including Pepsi, Molson-Coors products on tap, wine and coolers. Popcorn, pretzels, nachos and other tasty snacks and beverages including Pepsi, Molson-Coors products on tap, wine and coolers. 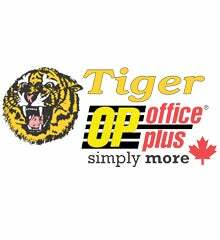 Popcorn, nachos and other tasty snacks and beverages including Pepsi, , wine and coolers, Molson-Coors products on tap. NOW FEATURING Yummy Doughnuts Mini Doughnuts. Molson-Coors products on tap, coolers, wine, water, Gatorade and snacks. Visit any of our portable bars and experience the greatest new technology in beer-pouring! Watch your beer pour perfectly—-from the bottom, in a matter of seconds! After you finish your beer, check your magnet for special local promotions or keep it as a souvenir. All of our portables also serve water, Gatorade and snacks for your convenience.